The Fisker Automotive board of directors was scheduled to meet this morning and among the topics of discussion would most certainly be the possible timing of Chapter 11 bankruptcy filings. Based on the results of today’s meeting, Fisker could enter bankruptcy proceedings within the week as the failing automaker works to protect what few resources that they have left. Fisker is expected to make a $10 million dollar payment on their $200 million dollar Department of Energy loan and while the company allegedly has about $30 million in hand – the company realistically will not have the money to ever pay back that government loan. The company has built a car in ages and with a great many of the vehicles already built being destroyed earlier this year, Fisker has no way of generating the kind of revenue needed to pay back the DoE loan. With all of the interested suitors pulling their interest after company founder Henrik Fisker left last month, bankruptcy appears to be the only option left as the company enters its final days. Fisker has previously attempted to renegotiate the terms of the government loans but with the company in very bad shape, the feds aren’t too likely to allow for any reductions in payment or extensions unless Fisker finds a new owner or some serious investors very quickly. After raising over a billion dollars in private funding over the past few years, it would be a miracle to find anyone else willing to dump money into a failing company now without their leader so a last minute sale seems like the only possible salvation from bankruptcy. In an effort to conserve cash, the company laid off about 75% of their staff on Friday but that has created a whole new problem for Fisker Automotive. It turns out that our government has a law called the US Worker Adjustment Retraining Notification Act (WARN) and this law states that a company has to give workers 60 days notice when they plan to conduct mass planned layoffs. Fisker didn’t give their workers 60 days or even 1 day as the management notified the workers last Friday morning that they would no longer have a job at the end of the day. Roughly 160 employees were laid off, keeping only those necessary employees who will either guide the Fisker Automotive brand to a new buyer – or into the grave. Unfortunately, Fisker may have violated federal law in doing so. One of those workers was Sven Etzelsberger and he has sought the help of law firm Outten & Golden LLP to file a suit in a California US District Court. Etzelsberger is seeking 60 days worth of "wages, salary, bonuses and other benefits" for not just himself – but for all of the workers that he believes were wrongfully laid off last week. In short, should Fisker have violated the WARN Act, the company could be responsible for paying those 160 or so workers all of the compensation that they would have received during the required 60 day period ahead of the mass layoffs. If the news that Fisker Automotive has $30 million in the bank, the suit filed by Etzelsberger could tap into that to pay the former company employees. Fisker will likely bank on the fact that the WARN Act does allow provisions for struggling companies but with money in the bank – Fisker might have a hard time getting out of that suit without spending some money. Under Chapter 11 bankruptcy proceedings, the Fisker brand may become a bit more attractive to existing automakers and foreign investors alike. Fisker has previously tried to market the brand to large auto groups including Fiat SpA but until the company official enters bankruptcy proceedings, any buyer would immediately be responsible for the massive chunk of government debt. Considering that an automaker that isn’t making money or building cars while also being in debt for over $200 million to the US government isn’t the most attractive business case, any interested parties will likely wait at this point to see if they can buy Fisker piece by piece via the bankruptcy move. That could allow an existing automaker to acquire the intellectual properties of the Fisker Automotive brand without incurring the $200 million in debt – plus any other debut facing the company which includes but is surely not limited to the pending lawsuit from the laid off workers. Fisker isn’t in a position to drag their feet at this point so news should come quickly over the next few days on the future of the brand. So the workers at a company that has no product, and is being propped up by taxpayer money, now want to sue because the company is going out of business? Sounds like the jobs bank wasn't just an anomaly in this crazy industry. Maybe the company's managers did know the law would apply, and they are purposely creating the scenario that would allow the workers to tap into that last $30 million as opposed to say, have it go back to the taxpayers? Or private investors. Or the state of Delaware which lost 7 figures of taxpayer dough keeping an empty factory warm last year. That's possible, John, but given history, the government will get first call on $ in a bankruptcy, not employees. They are always "top creditor" in a bankruptcy scenario. 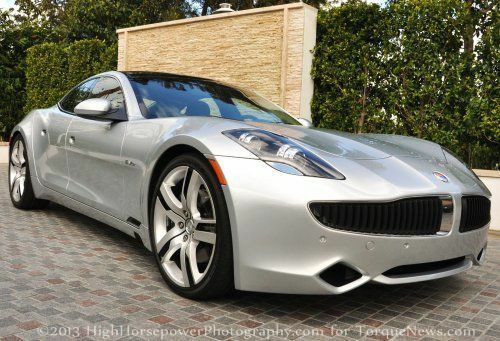 Plus this lawsuit will likely take weeks (or more), by which time Fisker will likely already be well into bankruptcy. I wish Elon would wait til a second after bankruptcy and then grab this awesome car and make it the Model K. Such a shame to see the car just go away. Fiskers equipment and facilities were used as collateral for the DOE loan, so potentially the DOE could own this company. Government Motors could expand here. Yahoo! Thank you, can I have another.